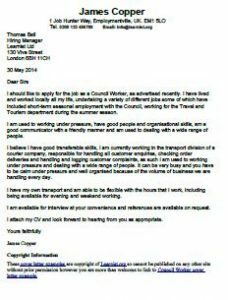 Cover letter example for a Council Worker position. Amend as suitable and apply for job vacancies. I should like to apply for the job as a Council Worker, as advertised recently. I have lived and worked locally all my life, undertaking a variety of different jobs some of which have included short-term seasonal employment with the Council, working for the Travel and Tourism department during the summer season. I am used to working under pressure, have good people and organisational skills, am a good communicator with a friendly manner and am used to dealing with a wide range of people. I believe I have good transferable skills, I am currently working in the transport division of a courier company, responsible for handling all customer enquiries, checking order deliveries and handling and logging customer complaints, as such I am used to working under pressure and dealing with a wide range of people. It can be very busy and you have to be calm under pressure and well organised because of the volume of business we are handling every day. I have my own transport and am able to be flexible with the hours that I work, including being available for evening and weekend working.